Let’s set a few things straight and delve deeper into the reasons behind why we should be consuming fat. 1)	Fat is not your number one enemy – especially not when you are intermittently fasting. (See previous post). 2)	Fat consumption does not cause weight gain. To the contrary, it might actually help us to lose weight! Eating the right kinds of fats feeds both the body and brain, all while keeping us fuller for longer, so we’re not as tempted to overeat or binge on sugary, crash-inducing snacks. Studies have compared people on low-fat, high-carb diets with people on low-carb, high-fat diets. The research proves that people who restrict their intake of fatty foods do not lose weight or gain other health benefits. In contrast, people who eat diets high in fat but low in refined carbohydrates like store bought white bread tend to lose weight and see other health benefits as well. These findings suggest that the real villain when it comes to weight gain isn’t fat, but rather added sugar and refined carbohydrates that get quickly broken down into sugar. Low-fat products are processed (sometimes they even use a chemical process to separate the fat from the dairy in order to make a product “low-fat”) and fillers like sugar or sweeteners (unnatural chemicals – mostly), are usually used in low-fat products to make them taste better. As we know by now, sugar, chemicals and fillers are much worse than fat. 3)	Good and bad fats are not necessarily as clear-cut as you think. We’ve all heard about food which contains good fats like avocado, salmon and nuts – but did you know that chicken skin and those delicious crispy bits of fat on a lamb chop are not considered to be the worst kind of fat? This is the ugly one that we need to avoid as far as possible. We also have to remember that there is naturally occurring trans fat and artificial trans fat. The golden rule is always “natural above artificial”. Eating small amounts of naturally occurring trans fat won’t be detrimental to your health. Avoid eating food that contain artificial sources of trans fat like vegetable oils that are laboratory-heated to prevent spoilage, as well as deep-fryer oils, margarines, and packaged foods like frozen pizzas and cookies. This one has a bad reputation, but some cardiologists have suggested that saturated fat isn’t the artery-clogger it was once thought to be. Even though this type of fat is not as dangerous as trans fat, it is still recommended to limit saturated fat intake. Most naturally-occurring saturated fats come from animal sources, like beef, pork, poultry, butter, cream, and cheeses. Yes – this means you should swop out your margarine for butter. There are two main types of polyunsaturated fats: omega-3 fats and omega-6 fats. Both of these types of fat are essential fatty acids, meaning the body cannot manufacture them and they must be taken in through diet. Omega-3 fatty acids are thought to protect against heart disease, inflammation, certain types of cancer, diabetes, Alzheimer’s disease, and macular degeneration (a leading cause of vision loss). Omega-6 fatty acids can help control your blood sugar and may reduce your risk for developing diabetes – although too much omega-6 in relation to omega-3s thought to lead to inflammation (which is at the core of chronic diseases, such as heart disease and diabetes). Omega-3 fatty acids are found in oily fish (such as salmon, trout and albacore tuna), walnuts, flax seeds and their oils. Eggs, chicken, and beef also have some omega-3’s on board. Omega-6 fatty acids are found in nuts, seeds and vegetable oils, such as soybean, cottonseed, corn, sunflower (oil & seeds), safflower oil, pine nuts and pecans. Monounsaturated fats aid in your good health in the several ways. They can help lower your “bad” low-density lipoprotein (LDL) cholesterol in your blood. When consumed in place of saturated and trans fats, they can help people with type 2 diabetes better control their blood sugar. 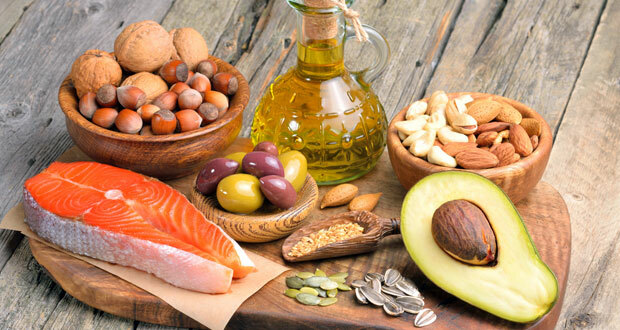 Monounsaturated fats aid in cell regulation and contain high levels of vitamin D, a hormone that regulates calcium levels, builds stronger bones, and supports immune function. Sources of monounsaturated fats include macadamia nuts, olive oil, hazelnuts, avocados, almonds, canola oil, pecans, peanuts and their oil. The bottom line – All fats provide nine calories per gram, whether they are monounsaturated, polyunsaturated, or saturated. Moreover, the fats and oils we consume are not comprised of just one type of fatty acids but several. For example, about half the fat is beef is monounsaturated while the other half is saturated. To ensure a healthier intake of fats, you need to consume foods with the highest percentage of monounsaturated fats. o	Half a banana/apple and almond/peanut butter with two tablespoons of full-fat plain yogurt. I don’t snack often, but when I do, this is one of my favourite healthy snacks.